Reading aloud is the single most important way to help children get ready to read. Reading together helps children connect words with language and understand that each book tells a story. Read to children in the language you are most fluent in. Reading aloud helps create the love of reading, regardless of your spoken language. 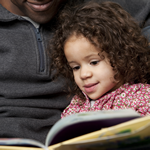 Reading together and talking to your child about what you are reading (dialogic reading) helps children develop vocabulary, comprehension and encourages children to use longer phrases. 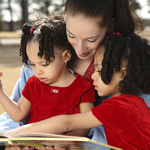 Reading aloud to children helps motivate them to become readers. Read every day, again and again. Your baby will love and learn from repetition. Let your baby explore books with all her/his senses. Choose baby-friendly books with bright and bold illustrations and made of cloth or soft plastic or board books. Keep sturdy board books in your diaper bag for on-the-go reading. Read every day and let your toddler help turn the pages. Create a reading fort under a table with pillows and books. Retell a story in a new way. Sing it, draw it or use simple puppets. Take a favorite book on a walk. Stop in a nice spot and read a page or two. Read every day and point to words as you read them. Go "undercover" and read after dark by flashlight. Keep a word journal. Write down and talk about new words you read. Check out these websites for great resources for literacy practice of reading. The following websites are great resources for the literacy practice of reading. Read "Big Brother Daniel" from Daniel Tiger's Neighborhood. Help Princess Presto's put on a spectacular spelling play. Make you own story book. Match the letters with pictures. Go through the alphabet and identify the upper case letters. Go through the alphabet and identify the lower case letters. Hear sounds of the alphabet and connect them to words and pictures. Listen to a famous actor read their favorite book. Super Why Saves the Day! Help Super Why save the day by collecting super letters. Match the letter bots to make words. 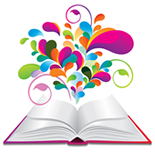 Learn to Read contains exciting interactive books and phonics games. Use the pieces to form each upper case letter. Listen to stories about family and animals, rhymes, and fairy tales too. Listen to some great stories. Listen to a favorite Beatrix Potter tale. Read a story with Peg and Cat.